14-Night luxury safari in Namibia and Botswana, ending at Victoria Falls. Guests go on a journey of southern Africa's fine, eco-friendly retreats. Starting in the Damaraland desert, to the CKGR, Okavango Delta, and the Linyanti wildlife region. This is a luxury 14-night safari is specifically aimed at showcasing sustainable ecotourism. Each of the camps visited on this epic adventure have been designed based on the 4Cs philosophy of the Zeitz Foundation: conservation, community, culture and commerce. In addition to offering the most superb safari sightings in Namibia's deserted Damaraland, Botswana’s famous Okavango Delta and Central Kalahari Game Reserve, and the Linyanti Wildlife Reserve, this tour highlights the concerted efforts made at each of the venues to conserve the precious environment in which they lie. From USD 12 000 in Low Season to USD 15 000 in High Season per person sharing. Guests will be flown from OR Tambo airport in Johannesburg to Windhoek. Upon arrival at Hosea Kutako airport in Namibia's capital, guests will take a light air transfer to Damaraland Camp in the Torra Conservancy. This is an award-winning camp, remotely situated high on the north bank of the Huab River in a prime wilderness area in Namibia. It offers sweeping views across stark plains, ancient valleys and the Brandberg Mountains. The camp consists of 10 spacious, ensuite units that are raised off the ground and adorned with thatch roofs. Adobe-style chalets are lavishly equipped with a walk-in dressing area and a large deck from where guests can enjoy the wonders of the desert. After a light air transfer from Damaraland Camp, the next 2 nights are to be spent at Desert Rhino Camp in the isolated Palmwag Concession. This region is marked for its tranquil, minimalist beauty, surprising wealth of desert-adapted wildlife and the largest free roaming black rhino population in Africa. Operating in collaboration with the Save the Rhinos Trust, activities include rhino tracking on foot or by vehicle; an exciting and rewarding experience that contributes toward the effort of conserving this endangered species. 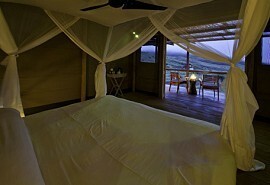 Accommodation at Desert Rhino Camp is in the form of 8 Meru-style canvas tents that sleep up to 16 guests. Raised from the ground on a wooden deck, each tent features an ensuite bathroom with a hand basin, flush toilet and shower. After 4 glorious nights in the most pristine region of Namibia, guests embark on the Botswana leg of the journey. 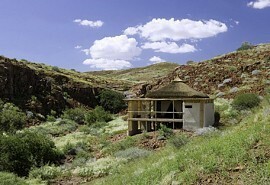 From Desert Rhino Camp, guests are flown to Windhoek, where they will spend a night at the Olive Grove Guesthouse. This is a small, luxurious guesthouse situated in the heart of Windhoek offering elegant accommodation in quiet and peaceful surroundings. 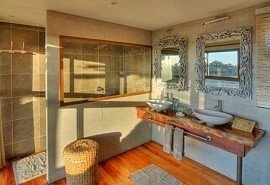 The Olive Grove Guest House prides itself in offering guests a personalised experience combined with luxury and charm. Guests will fly from Windhoek to Maun in Botswana, where they will take a light air charter to Kalahari Plains Camp. Here, guests will find themselves in one of the largest reserves in the world - the Central Kalahari Game Reserve. The CKGR is home to the legendary Kalahari black-maned lion as well as some of the world's best cheetah viewing. Guided game drives unlock the fascinating wildlife treasures found in this wonderful arid area. Kalahari Plains Camp is perfectly situated overlooking an immense pan with endless horizons and beautiful skies. It comprises 10 ensuite canvas units with a sleep-out above each from which to enjoy moonlit or star-studded nights. Solar power provides all the electricity and hot water in the camp, making Kalahari Plains a 100% solar-powered camp, while innovative insulated canvas walls and roof keep the temperatures inside the units comfortable. Following 3 nights spent in the CKGR, guests move on to the indulgent Vumbura Plains Camp in the renowned Okavango Delta. What makes the Vumbura concession so unique is its position on the extreme north of the Okavango Delta. Vumbura Plains Camp offers both land and water activities. It is very uniquely constructed and makes no exceptions for luxury. Each large, decadent room is raised off the ground on wooden decks and each comprises a bedroom, lounge, outdoor shower and full ensuite bathroom. Each room also has a plunge pool and 'sala'. A star-gazing deck with comfortable cushions protrudes into the floodplain, offering a place to gaze at the stellar skies or enjoy a sociable evening around the campfire. 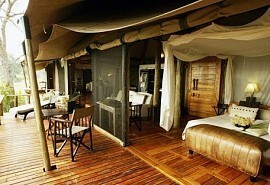 Next is DumaTau Camp in the wildlife paradise of Botswana - the Linyanti. Guests are flown to the camp via light air transfer from Vumbura Plains. DumaTau Camp, rebuilt completely in 2012, is raised off the ground to take advantage of the sweeping dramatic river views. Each ensuite tent is spacious, spreading out under a canvas roof, with a wraparound window that allows for dramatic views of the riverfront and the sounds of Africa to seep in. DumaTau Camp operates completely on solar energy for hot water, lighting and other energy needs. The region has all the habitat diversity to make it a haven for wildlife, and is well-known for its elephant concentrations as they congregate along the waterways and lagoons during the dry winter months. Coming to the end of the eco-friendly safari journey through Namibia and Botswana, guests are flown to the great and mighty Victoria Falls (via Kasane). Situated with an exceptional view of the Zambezi River, Toka Leya Camp boasts cool wooden flooring, tasteful, uncluttered African décor in earthy hues, climate-control for a cool summer sanctuary, expansive wooden deck from which to soak up the views of the Zambezi River. Activities at Toka Leya Camp include a tour of the Victoria Falls on the Zambian side, game drives within Mosi-oa-Tunya National Park, river cruises, fishing excursions and guided nature walks.This is the ultimate place to relax and unwind after such an exceptional journey discovering some of southern Africa's most luxurious, eco-friendly camps and lodges. After breakfast and morning activities at Toka Leya Camp, guests are transferred via road to Livingstone airport from where they will fly back to OR Tambo airport in South Africa, in time for onward travel arrangements. From US$6200 per person sharing.